There are a number of good quality wood turning lathes on the market right now. Delta, Jet, Powermatic, Nova, Rikon, Shop Fox, PSI... How do you choose the "right one"? Reading reviews is a good place to start. There are tons of different sources where you can find wood lathe reviews. Retailer websites, woodworking forums, magazine comparison tests, and personal websites like this one are all good resources. However, it can be very time consuming and tedious to search all over the web for them. Digging through the woodworking forums can be especially time consuming. When you do a search on a forum, you will get results where one person mentioned the particular wood turning lathe you are interested in on page six, and you have to scan all six pages to find it. And then, you don't know if someone else has another comment on the next page, or on the page after that... pretty soon you have spent twenty minutes just to find out that a couple of people mentioned the model you are interested in but don't own it! That's the reason I have created this website - to save you some of the aggravation of spending all that time searching the web for reviews. I have done the searching for you, and compiled wood lathe reviews and ratings from all the different sources I could find. I have listed the basic features and specs for each model, and included owner comments for many of them. If there are any common complaints or drawbacks for a certain model, you will find those too. When comparing different wood turning lathes, you can't just go by the average rating numbers you see on Amazon. If you actually read the reviews, you will find that sometimes a person likes the tool but gave it a low rating because they had a problem with Amazon or the shipping company. You will also see reviews that are actually for a different model, or even a "review" by a person that decided to buy a different brand! I have sorted those out as best I could, and actually have adjusted the ratings when necessary to weed out reviews that were not relevant. 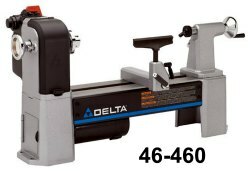 Delta: There are currently two Delta wood turning lathes available, the 46-455 and the 46-460. They are essentially the same machine with different motors and pulleys. The 46-455 has a 3/4 HP motor with five speed pulleys, and the 46-460 has a reversible 1.0 HP motor with variable speed control and three speed ranges. They fit into the "midi-lathe" category, with a 12-1/2" swing over the bed and 16-1/2" between centers. There is an optional bed extension available that will increase the distance between centers out to 42". Both have 24-position indexing and a self-ejecting, hollow tailstock. The Delta 46-460 is the more popular of the two models. The variable speed control will let you slow the workpiece down to 250 RPM in the lowest range, and the reversible motor is a rare feature on lathes this size. The Delta wood lathe reviews overall are good, but a few owners have reported issues with getting replacement parts when they had a problem. The Jet mini lathe reviews are excellent overall. The mid-size Jet wood turning lathes all use a Reeves-type drive system, which lets you change speeds on the fly by just moving a lever, but it has some quirks also (go to the review page to find out more). The mid-size Jet wood lathe reviews are not quite as good overall as the Jet mini-lathes, but are still excellent. The full-sized Jet wood lathe reviews are also excellent. Jet really knows how to make a quality machine! Nova: Many woodturners are familiar with Nova's popular line of chucks and other accessories, but Nova makes some fine wood turning lathes, too. The 1624-44 has a 16" swing and 24" between centers, and comes with a 1.5 HP reversible motor. The headstock swivels for outboard turning, and it has eight speed ranges from 215 to 3600 RPM in the US (178-3000 RPM in other countries). There are a large number of happy owners on the forums. The DVR XP has the same bed and tailstock as the 1624-44, but uses a direct-drive 1.75 HP (or 2.0 HP on 220V) motor. The motor is reversible and has variable speeds from 100 to 3500 RPM. It also has lots of happy owners on the woodworking forums. Both of these Nova wood lathes get great overall reviews on the retail websites, too. Nova has recently come out with a couple of new models. The Comet II is a midi lathe with a 12" swing, 16-1/2" between centers, and a reversible, 3/4 HP motor. The motor is variable speed, with three different ranges covering a 250 to 4000 RPM total range. The DVR 2024 wood lathe is aimed at the bowl turning enthusiast, with a 20" swing and 24" between centers. It uses a 2HP direct drive reversible motor like the DVR XP, with a speed range from 100 to 5000 RPM. These haven't been out long enough to have many reviews, so I will have to cover them in more depth after they have been out a little longer. Powermatic: A serious turner needs a serious wood turning lathe, and the Powermatic models fit the bill. The 3520B has a 20" swing and 34-1/2" between centers, with a reversible 2 HP motor. There are two speed ranges, giving you a total range of 50 to 3000 RPM. The "Mustard Monster" (as the 3520 is called in the woodturning community) has a bunch of loyal fans. This is a heavy piece of equipment and is more expensive than any of the others I have reviewed, but it is actually less expensive than pretty much anything else out there with the same capabilities. If the 3520B just isn't quite big enough, the Powermatic 4224 might be! It has a 24" swing and is 42" between centers. The 3 HP variable speed motor is reversible, and it has three speed ranges that give you a total range of 0 - 3500 RPM. Powermatic wood lathe reviews, again, are excellent overall. There are several other brands I have not gotten to yet that are worth a look. Shop Fox has several wood turning lathes that are value-priced but still get decent reviews. The Penn State Industries (PSI) Turncrafter Commander also gets good ratings. Rikon has several models that get good reviews, too. I actually own a Rikon mini lathe, but haven't used it enough to do an in-depth review of it yet. I hope to spend some "quality time" with it over the next few months, and will write a review once I have a little more experience with it. Of course, there are other "premium" brands if you can afford the price of admission. Oneway, Stubby, VicMarc, Serious, Robust... all are premium lathes at premium prices. I will be adding reviews on all of the above brands of wood turning lathes as time allows. Note: If you are new to woodturning or a veteran that is interested in getting more out of your lathe, there are tons of great woodturning books out there. The ones that are recommended most often for beginners on the woodturning forums are Turning Wood with Richard Raffan and The Lathe Book: A Complete Guide to the Machine and Its Accessories by Ernie Conover. Either of these books would be great as an introduction to woodturning - I have an older edition of Richard Raffan's book and it has been a great resource for me as a beginning woodturner.